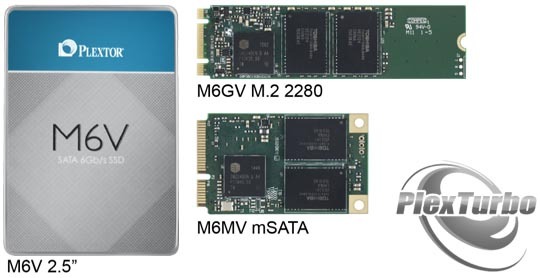 SSDs may have always felt unattainable to average consumers, but today, the leading global SSD brand Plextor has released a new mainstream SSD - the M6V series SSD. Perfect for beginners looking for a PC upgrade that noticeably increases speeds; the M6V is also equipped with the all new exclusive PlexTurbo, Plextor’s smart SSD cache technology. It aims to allow your average consumer to gain access to optimal high performance and the durability that SSDs brings. The M6V series uses SMI’s newest generation 2246 controllers, which have outstanding high-performance, low-power utility. They also use Toshiba’s newest and highest-level 15 nm process Toggle NAND flash memory with sequential read/write speeds up to 535/455 MB/s and random read/write speeds up to 83000/80000 IOPS. This great combination along with the superior customization of Plextor’s exclusive firmware makes the M6V a great choice for consumers. Besides the excellent pedigree of the product itself, the M6V series that Plextor released is also equipped with PlexTurbo, which shined during COMPUTEX 2015. It uses dynamic cache buffer instead of the average SSD cache, and can automatically identify cold and hot data, releasing the cold data from the system cache and making use of memory cache space more efficiently. The three major features of PlexTurbo include: increases access performance up to 8 times, prolongs SSD usage life, and prevents memory cache data loss. Upholding Plextor SSD’s excellent, stable performance and quality, the M6V also passed rigorous tests executed with Plextor’s strenuous SSD testing equipment. Professional simulations on actual read/write statuses were performed with several “Plextor endurance testing mechanisms” to ensure that the M6V series SSD have a MTBF (Mean Time Between Failures) of 1.5 million hours. Three-year warranty and global Plextor extensive support and maintenance center services are also provided. - Plextor M6V series SSD is estimated to hit the SEA market in August 2015, and will come in three specifications and capacities shown in the table below.